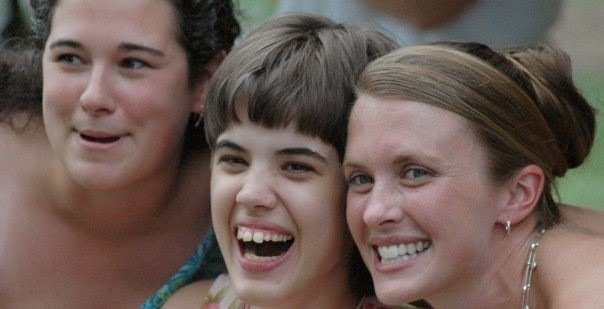 This post first appeared on the YL Capernaum Everywhere blog. When I was getting started with Capernaum in Baltimore, Sarah was the first friend I met. She, along with her parents, taught me so much about what it meant to do ministry alongside of my new friends with disabilities. She has since graduated from YL Capernaum and is heavily involved in her local church. I have asked Sarah if she would be willing to type out some of her thoughts about Capernaum and what it's like to now be involved in her church. Her answers are stunning. I hope you enjoy! What did you love about being involved in Capernaum? My name is Sarah Brintnall and I am 26 years old. I am writing this by two head switches because I can’t use my hands to type. The first thing I loved and still love about being involved in Capernaum is that I was able to make friends from night one. You see, I am in a wheelchair because I have cerebral palsy. Due to the kind of cerebral palsy I have, I am unable to speak, feed myself, and do the daily tasks the average person would probably take for granted. You know, my first church wasn’t “disability “ friendly at all except for one or two dear friends like Ms. Kathy (who is an amazing woman in my eyes ) and my own grandmother (which now my family is taking care of because she has really bad dementia ), and my own family, nobody made the effort to learn how to communicate with me. Nobody made their programs accessible for me. The physical church building also wasn’t totally wheelchair accessible for me. The only way I could “participate “ in these programs was if a family member took me and stayed with me to help me to participate in these programs. What I immediately fell in love with Capernaum is that they were all in with both feet from night one. My amazing mother was planning on staying with me that first night at the Goodman’s house where regular middle school WyldLife club was going on. Because my middle school speech teacher was actually the one who invited me, when I arrived, my speech teacher and these two amazing girls told my Mom “see you in two hours!" I also have two wonderful older brothers who do not have disabilities. Capernaum helped my parents spend time with them because when I was with my new friends, my parents now had the “freedom" to spend time with them without always taking care of me. From night one, my new friends made everything at WyldLife club totally accessible for me. They made the effort to learn how to communicate with me, they made the effort and the necessary time that summer to learn how to take care of me before going to a regular 5-day middle school WyldLife camp at Rockbridge down in Virginia. I absolutely loved how my 3 new friends did everything humanly possible down at Rockbridge for me to participate in every single camp activity just like all the regular middle school campers. Before I started Capernaum, I only had so many activities to do outside of the typical school day because of my cerebral palsy. Capernaum literally opened a brand new world for me and everybody in my world. Thank you Capernaum!!! How did Capernaum help you grow in your relationship with Jesus? Like I mentioned earlier, my first church wasn’t “disability" friendly at all. The only person outside of my family who really intentionally took the time to really sit down with me and talk to me and help me grow in my relationship with Jesus was once again my dear friend Ms. Kathy. She had 3 kids younger than me. It was hard for her to get out during week nights to come over to my house to help me grow in my relationship with Jesus besides after church on Sundays. When I got involved with Capernaum, again my leaders made everything accessible for me and for my other friends who also have physical/mental disabilities to help us get familiar with Jesus Christ and they helped us get familiar with the bible. After about a year or so of doing regular Young Life club (which is a weekly fun time where we play games, have a awesome worship experience, and hear a short message from a Young Life leader about the God who created and loves me unconditionally), I accepted Jesus Christ as my personal Lord and Savior. I was at a Young Life weekend when I accepted Jesus Christ. Before that time, people in Capernaum gave me things to help me to start my personal journey with Jesus Christ. Things such as: a bible, good worship cd’s for me to listen to regularly, and personal time with my Capernaum leaders to talk about Jesus. Another way Capernaum helped me grow in my personal journey with Jesus Christ was something called campaigners. In regular Young Life, Campaigners is where you meet before or after club to learn and grow deeper in your personal relationship with Jesus Christ. They would share a meal together out. For my disabled friends and me, my Capernaum leaders would make another night possible during the week to have campaigners. We would have a short time for light supper to share together but most of the two hours of campaigners was teaching time for our Capernaum leaders to teach and proclaim the word of God and they would proclaim the gospel to us. We would talk about who Jesus Christ was and we would talk about why Jesus Christ had to die on a cross for our sins. Without my Capernaum leaders which played a huge role in my life, along with my amazing family and a couple other of my amazing friends, I don’t think I would be the woman I am today without them. Once again thank you Capernaum! Now that you are older, you have gotten very involved in church. Can you tell me about the things that you do with your church? I have to say that my church which is now Grace Fellowship Church is completely and utterly awesome! My family and I have been attending Grace regularly for about the past 5 years or so now. There is so much I could talk about that I can’t decide where to start. First things first. When you just step inside the doors at Grace Fellowship Church, you automatically feel accepted and loved just by the awesome greeters who stand at the door every Sunday rain or shine. What I also I fell in love with at Grace was that the physical building itself was already totally wheelchair accessible. The building didn’t look “churchy" which I personally liked and still like. I think I was around age 22 or 23 when my Mom and I started what is called Women In The Word which happens almost every single Wednesday morning from late September to early May with a winter break. That is where my brand new “church world “ literally opened up and took off running. My first year at Women In The Word was just amazing. I will just share 2 or 3 of my experiences. Number 1, when I started, the classes were broken up into semester classes. My first two semester classes were taught /led by two amazing women in my eyes. I remember the very first morning when I “walked “ into that classroom. Ginny Becker and Christine Beck welcomed me personally. I would say probably after just 2- 3 weeks just from watching my amazing mother communicate with me, Ginny and Christine picked up how to communicate with me basically all by themselves. I absolutely loved that experience. Number 2, I “walked “ into class one morning and without my Mom saying anything, Ginny and Christine immediately knew something was very very wrong with me. I didn’t smile at them. They stopped what the rest of the class was getting ready to do and they prayed over me. I had hurt my back at home the night before. I couldn’t stay in class that morning. Christine told my Mom “I will take Sarah out and I will take good care of her. You stay in class and pay attention and let the other women take good care of you." I love my church! Another thing I have the privilege to get to be involved with at my church is what we call REST days. 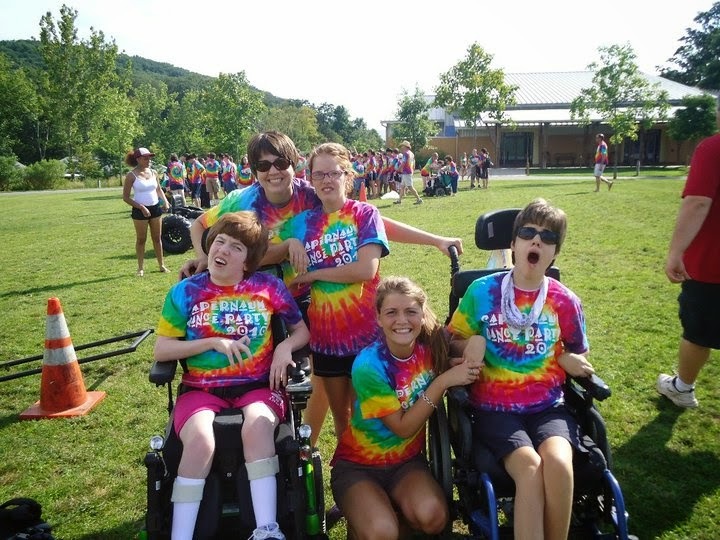 Rest day is where we take 4 Saturday afternoons during the school year to love on families affected by disabilities. Basically what a typical rest day looks like is: first we setup the entire church for the afternoon. Second, we have a little training from 12-1pm for the volunteers who might need a little help. All the kids with disabilities come at 1pm and stay until 4pm. The parents leave and they get a break. We have 4-5 activity rooms where each group will rotate through. When the parents come back to get their kids, they get a fully prepared dinner which the kitchen team prepares for them during the afternoon. It is just an awesome afternoon to see God work! I used to be a “kid “ who participated in rest days but now I get the privilege of serving kids! Another thing I get the privilege of doing every year with my church is decorating the whole church building for the Christmas season. It is just a awesome morning to serve and work alongside my church friends! How has it been meeting regularly with women like Sarah Batley and Kit Elmer? Totally awesome! I didn’t really meet regularly with Sarah Batley and Kit Elmer until just this past year. It is a privilege to me that they would take time out of their busy schedules and busy lives just to hang out with me. This past year Sarah Batley and I have been meeting once a month to just hang out and do different activities outside my house. Some activities we do are: going to the mall to go Christmas shopping, going to the movies and then lunch afterwards, going to her house and doing different activities like helping her make cookies for a bake sale, and going to an art museum. This past year Sarah has been a huge blessing in my life. This past spring was when I really started to hang out with Kit Elmer. Kit is such a amazing woman in my eyes along with Sarah. Now that I am a young woman at 26, I was outgrowing Capernaum and everything that goes along with that. I kind of feel like God has put these two amazing women along with some other amazing women like Ginny Becker to bridge that gap for me. Again, it is just amazing to see God work and it is amazing to watch how God weaves people in and out of our lives!